Why you should take your mobile with you when you go for a hike. When on a walking holiday around the Isle of Wight coastal path you can?t help but see the fabulous views, interesting buildings and varied landscape. However, sometimes it is worth a detour off the route to visit additional places of interest. Just outside Ventnor it is possible to do a loop up into St Lawrence to visit the two churches of the village. Take the footpath V96/V95 to Woolverton Rd. turn Right to the main Rd (Undercliff Drive) and take the footpath you see in front of you that is a bit of an uphill hike you will come out next to the old 13th century church one of the smallest parish churches in the UK seating around 40. It is Nestled into the landscape and built in a simple style from local stone. Open throughout the day, tall people will need to duck as they enter the low threshold. 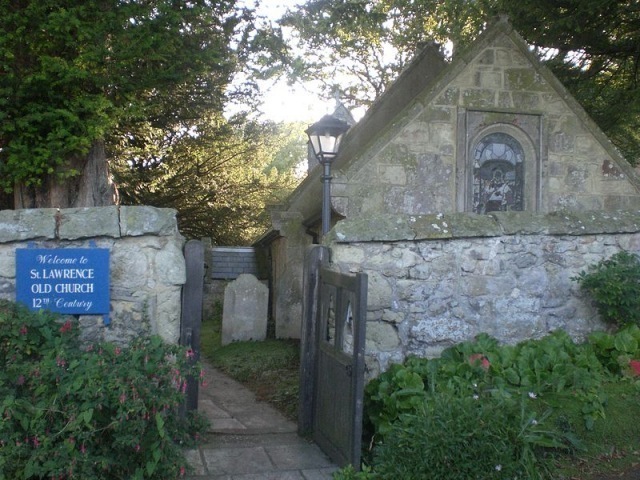 It has a welcoming feel and both churches offer refreshments for the weary walker with a donation. Once you have had a look around turn right and walk down Seven sisters road passing a couple of pretty cottages until you get back to the main road turn Right and after a few minutes you will see the new church built in the 19th century. Designed by Sir Gilbert Scott the Parish Church has some lovely pre Raphaelite stained glass windows crafted by Edward Burne - Jones, William Morris and Ford Madox Brown some of which were recovered from the National Chest Hospital when it closed in 1960. St Lawrence has its own maritime climate and is protected from the worst of winter?s weather by the Undercliffe. You are likely to see a red Squirrel and many of the gardens have a subtropical feel.